Representatives from 18 local licensed premises were presented with their prizes at Buccleuch Arms Hotel in St Boswells last night (Monday 25 March). 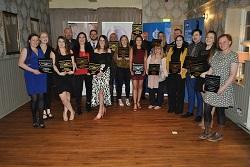 Bars from across the region have been recognised for their commitment to a safer and more secure environment for the public. Each premise is now accredited to the Best Bar None scheme. The Queens Head in Kelso is also in running for a national Best Bar None Scotland award, with a ceremony due to be held in Dunblane on Thursday (28 March). “It’s really reassuring to see our bars taking customer care and safety seriously, which is what Best Bar None is all about. Images from the awards ceremony are available from Scottish Borders Council’s Flickr page.